Aladdin, adapted from the Disney film and centuries-old folktales including "One Thousand and One Nights," is brought to fresh theatrical life in this bold new musical. 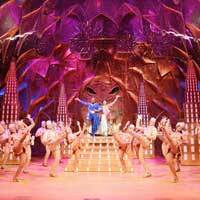 Aladdin's journey sweeps audiences into an exotic world of daring adventure, classic comedy and timeless romance. This new production features a full score, including the five cherished songs from the Academy Award-winning soundtrack and more written especially for the stage.